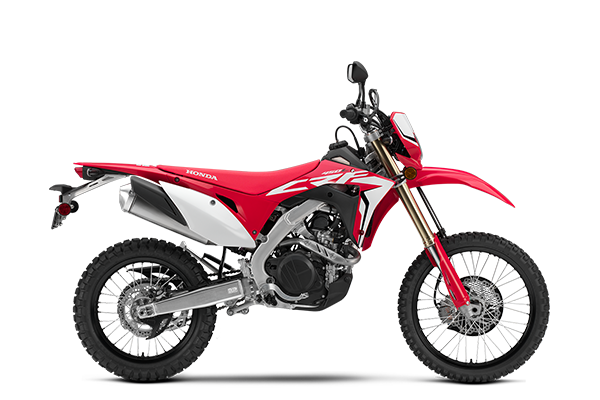 Fully Street Legal The CRF450L is equipped with a catalytic converter and is fully street legal in all 50 states. That means you can ride it wherever it’s legal to operate a motor vehicle—in state and national parks, on the road, on public lands. Plus, you don’t need to haul your bike to the trailhead in a truck or on a trailer. Best of all, it makes finding gas a breeze. Electric Start An electric start system ensures trouble-free starting in all conditions. The electric starter also drives the clutch side of the crankshaft to provide superior lubrication to starter gears while producing a narrow engine with a short, strong crank. 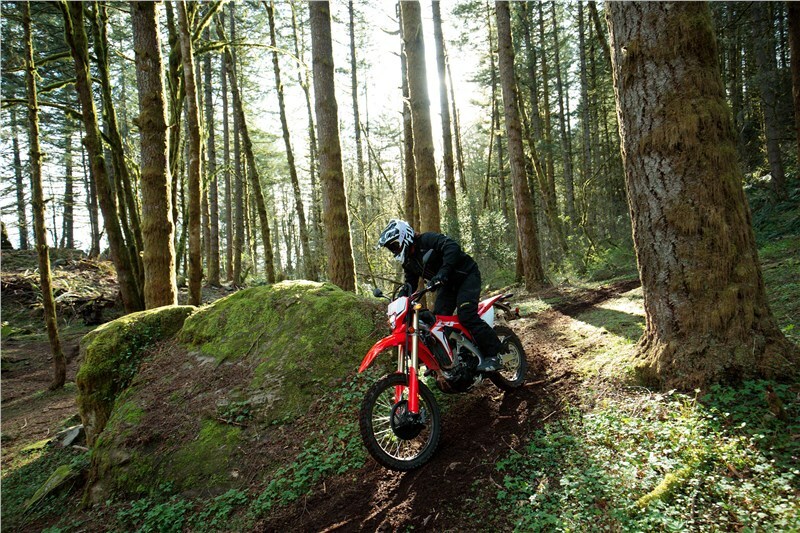 Six-Speed Transmission Like our CRF450X, the CRF450L rocks a six-speed gearbox. That gives you a low gear perfect for tight, slow situations, and a top gear that’s tall enough for highway riding to the next gas stop or trailhead. 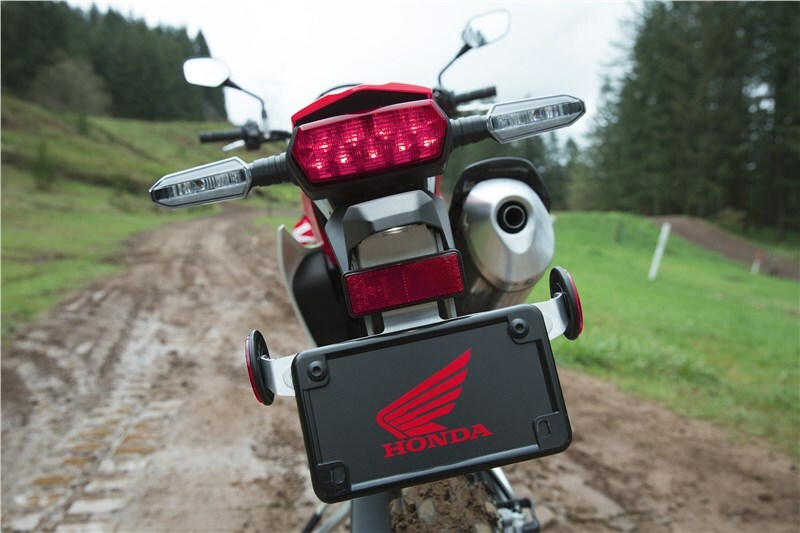 Lithium-Ion Battery Light, compact, and offering excellent performance—just like the CRF450L itself! Conventional batteries are heavy, but not this premium piece. 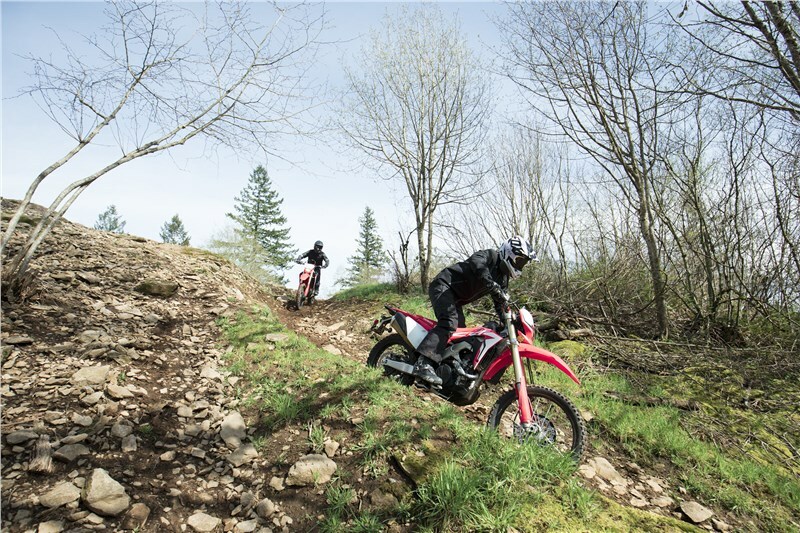 It’s all part of why your new CRF450L performs as well as it does. Inertia-Tuned Crank We redesigned the CRF450L’s crank to have 13 percent more inertia than the CRF450X. Why? To smooth out power delivery and make the engine more user-friendly in tight, technical situations. Dual Radiators The CRF450L’s dual radiators feature a refined core area for superior heat dissipation compared with conventional dual-radiator designs. A coolant recovery tank is located in front of the engine between the frame downtubes for improved center of mass, and the tank is protected by a plastic skid plate. Final-Drive Sprocket Damper Designed to keep your bike quieter while not adding any weight, these unique drive sprockets are just another example of the CRF450L’s innovative engineering. Electric Fan The CRF450L is a “ride anywhere” type of bike, and because conditions vary so widely, we’ve equipped it with a light electric fan for the radiator. Rock crawling or riding on a hot Arizona single-track, it helps keep your engine running cool. Titanium Fuel Tank Holding 2.01 gallons, the CRF450L’s premium titanium tank is light and tough. Skid Plate The CRF450L’s factory skid plate is light, yet also offers the engine and lower-frame protection serious riders demand on a machine like this. LED Headlight The CRF450L features an all-LED lighting package, including the headlight. That’s a big deal, because it takes a lot of weight off the front end. And the lighting pattern is also specially designed for both on- and off-road situations. LED Taillight The LED taillight is integrated into the rear fender. It’s light, compact and rigid. 449cc Unicam Engine Honda’s Unicam cylinder heads combine the best of single- and double-overhead-cam designs. The configuration contributes to a compact engine that saves weight over a comparable dual-overhead-camshaft motor and also permits a narrow included valve angle. This flattens the combustion chamber to facilitate ignition flame propagation, allowing a high compression ratio. Since less space is taken up in the cylinder head, the camshaft sits lower in the head for a more compact engine and a lower center of gravity. Titanium Intake Valves Lightweight titanium intake valves permit use of smaller valve springs, reducing overall engine height. Fuel Injection The CRF450L features our proven fuel-injection system. 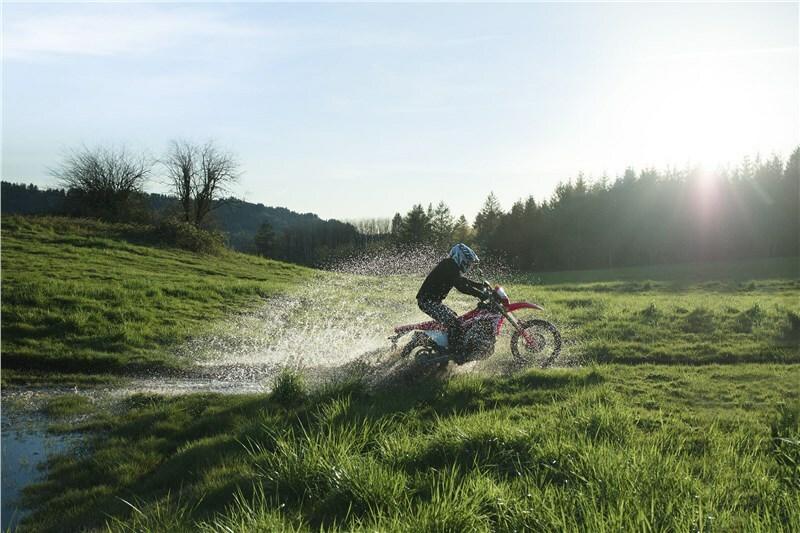 It’s part of the reason the CRF450L offers such excellent torque and spot-on metering and response, especially in the critical low-rpm range. It also automatically compensates for elevation and weather changes. Twin-Spar Chassis This is the same design as our all-new CRF450X uses, and that’s a really big deal. It means the CRF450L is a true off-road bike, and not some compromise. 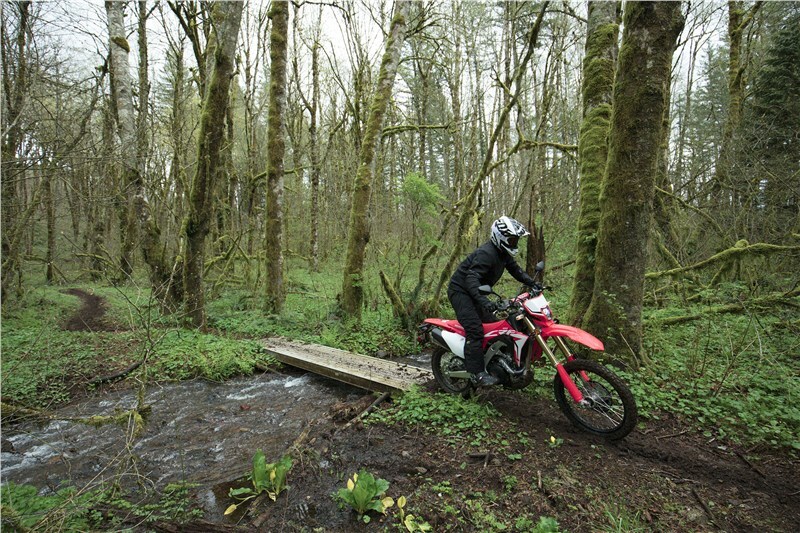 The twin-spar aluminum frame is both light and stiff, and provides the basis for the CRF450L’s excellent handling. The chassis geometry is specially selected for responsiveness, and also is wider than the standard MX frame to accommodate the six-speed transmission. 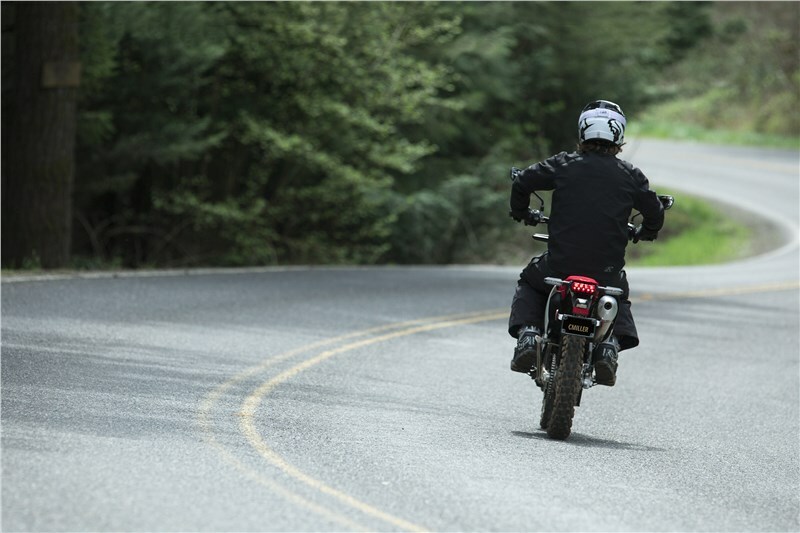 IRC GP Tires The CRF450L’s tires give you good off-road traction and on-road life. Tires are always a critical part of any on/off-road bike, and we’ve hooked you up with some great ones here. Low Center of Gravity The compact Unicam engine and Honda’s famous concentration on center-of-mass engineering help keep the CRF450L’s center of gravity low. That means the bike feels lighter, and it helps handling too. Works-Style Front Brake Compact twin-piston front brake caliper, anodized-aluminum brake pistons and lightweight 260mm front disc offer great stopping power while minimizing unsprung weight for improved turning and handling. Works-Style Rear Brake HRC works-type rear brake system uses a 240mm brake rotor combined with an integrated rear master-cylinder and fluid reservoir, a set-up that eliminates the separate reservoir and hose. 18-Inch Rear Wheel The CRF450L’s 18-inch rear wheel gives you an excellent choice of on/off-road tires. Gear-Driven Counterbalancer The Gear-Driven Counterbalancer reduces vibration and drives the water pump. Eight clutch plates provide the surface area necessary to handle the engine's massive torque, while carefully matched clutch springs provide a light feel at the lever. Works MX Styling Having a hard time spotting the differences between our factory MX bikes and the new CRF450L? You’re excused. The “L” looks like our MX bikes because it’s derived from them—the smooth bodywork makes it easy to move around, and the in-mold graphics not only look cool but are durable, too. Superior Ergonomics Placing the rider’s legs at the narrowest part of the frame helps improve comfort and handling. Sidestand Hey, a sidestand may seem like no big thing, but take a look at the one the CRF450L uses. Tucked up high and out of the way, this forged alloy piece is just another example of how the CRF450L gets it right.